The National Weather Service (NWS) has issued a Wind Chill Advisory Tuesday through Thursday as cold temperatures and high winds settle into the area. 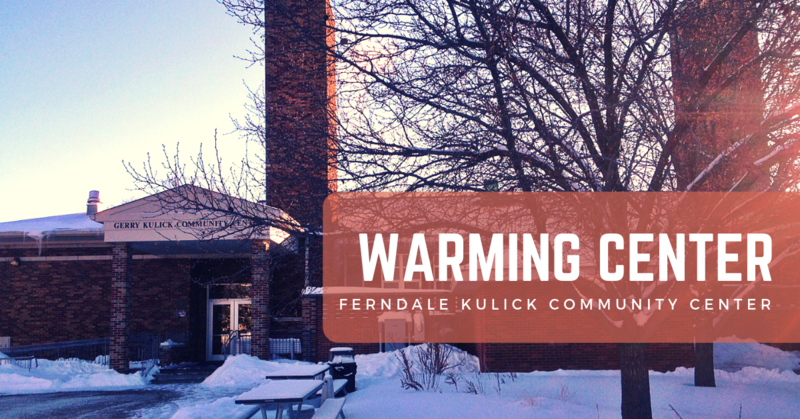 In response, the City of Ferndale will offer the Kulick Community Center, located at 1201 Livernois St., as a public warming space. The center will be open Tuesday, Jan. 29, through Thursday, Jan. 31, between the hours of 10:00 a.m. and 8:00 p.m.
As a reminder, the Kulick Community Center is open to all and provides a warm space and access to restrooms and fresh drinking water. We recommend that you bring food and water bottle (there is a bottle-fill drinking fountain available), books and other quiet activities, and any other comforts from home. The Center does not provide beds or bedding, meals, food, or medical supplies. If you have questions, please contact the Kulick Community Center at 248-544-6767.